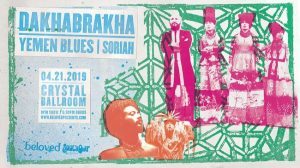 We are giving away a pair of tickets to Soul’d Out Music Festival Presents DakhaBrakha + Yemen Blues @ Crystal Ballroom on April 21. To win, comment on this post why you’d like to attend. Winner will be drawn and emailed Friday, April 19. DakhaBrakha was created in 2004 at the Kyiv Center of Contemporary Art «DAKH» by the avant-garde theatre director – Vladyslav Troitskyi. Theatre work has left its mark on the band performances – their shows have never been staged without the scenic effects. Accompanied by Indian, Arabic, African, Russian and Australian traditional instrumentation, the quartet’s astonishingly powerful and uncompromising vocal range creates a trans-national sound rooted in Ukrainian culture. At the crossroads of Ukrainian folklore and theatre their musical spectrum is intimate then riotous, plumbing the depths of contemporary roots and rhythms, inspiring «cultural and artistic liberation». DakhaBrakha has played concerts and performances and has taken part in numerous international festivals in Ukraine, France, Great Britain, Ireland, Austria, Slovenia, Netherlands, Belgium, Czech Republic, Slovakia, Rumunia, Italy, Spaine, Portugal, Greece, Germany, Finland, Denmark, Sweden, Norvegia, Belarus, Georgia, Hungary, Poland, Chine, Australia, USA, Canada, Columbia, New Zealand, Brazil. What a sight for the eyes and mind this show would be!! Just heard this their music for the first time And I am so soul’d!! The music ! The Dancing! Oooo this would be great! These folks are AMAZING. Yes, please!! Dude, I really want to see this show! Their carpathian rap is frickin awesome. And their throat singer that’s opening for them is frickin awesome! Please choose me! This would be such an awesome show. I have a friend who would just die at the chance to see them with me! Thank you for the opportunity to win.I love this venue and all the great live shows that pass through these doors.it is what memories are made of. I’m visiting Portland with my girlfriend for a few days and looking for cool things to do and I figure why not. I’m sure it would be great! I actually had to look them up, but I’m glad I did. Thanks! I’d love to win because I’m visiting Portland and would love to be mind-blown by these incredible bands! Id love a chance to see this band. I’ve heard many a great things!!! I once came upon a traveling group of Avante Garde Ukranian performance by chance on the streets of Busan, South Korea. It would feel like I’d come round full circle (although more intentional) to be able to see them here in Portland! I came upon a group of Avante Garde Ukranian performers once on the streets of Busan, South Korea. To see them here in Portland would feel like I’ve made a full hemispheric circle and feed my nostalgia for the last city I called home! I’ve never been to a concert and would love to experience it. I have three kids and need a nice, enjoying night out and this would be awesome! I hope I will thank you!! Would be such a delight to go, loved watching them on Live with Jools. Super excited to see these artists, I’ve heard they are not to be missed!